A little compilation, but click on the text links not on the photos (sorry I’m lazy, but linking the thumbnails to the posts would be very time-consuming). It differs from other country’s V-day. Of course, there are few Christians and the celebration is not of religious origine. It was created as a marketing event. In 1936, an expat chocolate artisan called Morozoff started promoting the “Valentine Day chocolates”. It became popular from the 1950’s. On February 14th, Valentine Day : Ladies offer small boxes of chocolates to gentlemen they find attractive. And they also offer some to gentlemen they don’t care about, to avoid making them upset. Those are “giri choko” (obligation chocolates). On March 14 th, White Day : Gentlemen that received chocolates give a thank-you present to all ladies that made them a gift. The value varies a lot, depending on their feelings for the ladies. There were legends, in the glorious days of VD-WD, about guys receiving a tiny box of 1 piece of al’cheapo chocolate and thanking with a luxury brand hand-bag or a jewel. And also horrid stories, about naive young women living their first workplace VD, giving “giri choco” to all coworkers, but then they received the most vulgar pieces of lingerie from creepy middled aged guys, that were their managers. From dreams to nightmares. Now, it became a old. Not fun anymore. So in the last 10 years or so, the number of people playing the game has decreased. In the 1990’s, I could see handsome young guys receiving several times their weight in chocolates, from all women aged 5 to 95, in a circle of 5 km around them, coworkers, customers, neighbors… Now, they get only a few. Maybe of better quality, and with more sincere feelings. 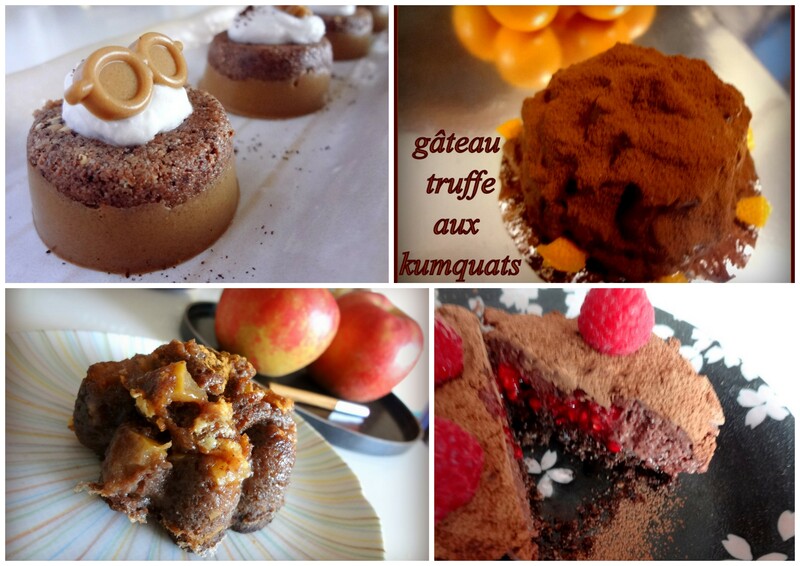 Posted on February 10, 2011 by My	• This entry was posted in Avec la recette, French / Cuisine francaise, Ingredients, Japan/ cuisine japonaise, Snacks-Petits Gouters, Uncategorized, With recipe and tagged chocolat, chocolat chaud, chocolate, cocoa, cocoa mass, compilation, daifuku mochi, dessert, desserts, fondant, ganache, gateau, giri choko, goma, macaron, mochi, mousse au chocolat, pate de cacao, praline, Saint-Valentin, sorbet, sweet, tartelette, tomo choko, tomochoko, truffes, truffles, Valentine Day, wagashi. Bookmark the permalink. Do they tend to buy or make the gifts? I have no official statistics, but for the chocolates, I’d say 98% buy and 2% make. Given the really huge volume, the number of people that make theirs is very important. I think everybody -that still follows the tradition- buys some pre-packaged for the many people they don’t like so much, and for the special persons, they make or decorate something, they wrap themselves or they select/order exactly what the person prefers. There are many “kits” to make or even just decorate yours, but some people make everything from scratch and in this season I can find more easily cocoa butter, cocoa mass, nibbles, molds, whatever. The most impressive is the wrapping and DIY boxes. I will try to make another post about what they sell.